Newsboy hats are not just the hat for old, middle-aged women. People who are updated with trends and styles know that in good use, the newsboy hat is an essential hat for any wardrobe. A newsboy hat can be worn in formal or informal occasions, with formal or casual clothes, depending on the style of that newsboy hat. You might feel overwhelmed with thousands of options that you might have when in the search for a suitable newsboy hat. The newsboy hats on the market are not really different in design. They come with the classic 8 panel structure and a stiff pre-curved brim. However, there are certain features that you need to consider such as materials, constructions, as well as colors. 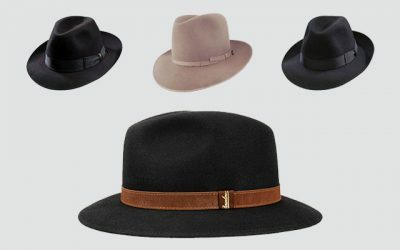 Check out some of the best newsboy hats for women that you can possibly have on the market. 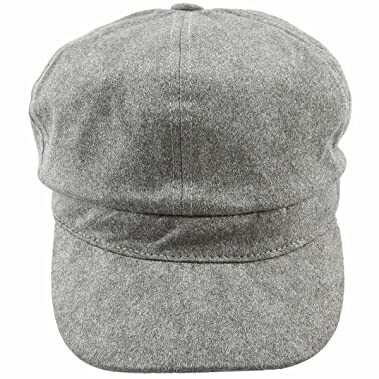 Its Main Features: This newsboy hat is made of 100 % of cotton. 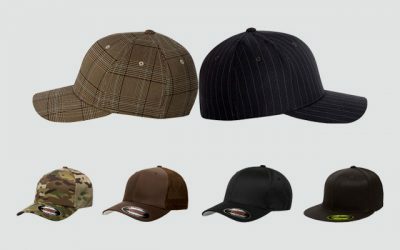 It features the design of a newsboy cap with 8 panel structure. There are 15 options of solid colors for you to choose from including red, pink, black, and brown. It is available in 1 size that can fit head’s circumferences from 21 to 23 inches. The height of the crown is 5.5 inches while the width of the brim is 2.25 inches. 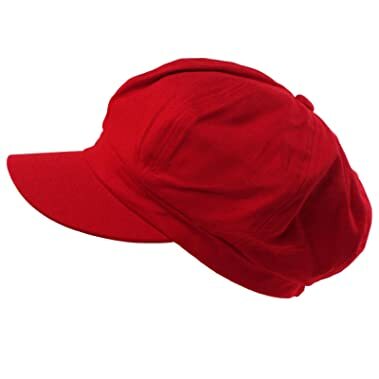 This newsboy hat is made of the premium cotton material which is soft and smooth to the touch. In addition, the fabric makes the hat lightweight and comfortable to wear. It is also well ventilated to keep your head cool and dry all of the time. Another thing worth mentioning is that this hat comes with an interior sweatband which is highly effective in wicking moisture away. It also doesn’t come with interior lining, which adds extra comfort for you when you have to wear the hat for a long time. And the sweatband is super stretchy for the hat to easily contour to the shape of your head. Therefore, even when the hat is available in 1 size, you can easily have a better and more customized fit with this hat. Last but not least, the fabric of the hat is thick enough to prevent the harmful elements of the harsh sun rays to get into your skin, protecting your face, your ears and your neck effectively. The body of the hat is quite soft while the brim is stiff. It comes pre-curved but you can still bend the brim of this hat to the shape that you like. 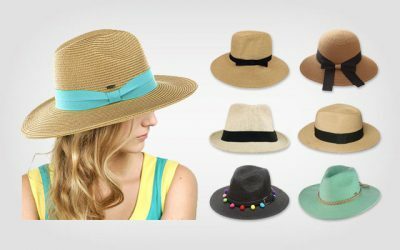 With its lightweight, softness, and breathability, this newsboy hat is one of the best options in case you are searching for a women’s newsboy summer hat. Its Main Features: The material of this hat is 100 % wool. This newsboy hat is available in 5 options of colors such as grey, black, and white. It is available in 1 size that can fit head’s circumferences from 21.3 inches to 22.8 inches. The height of the crown is 3.5 inches while the width of the brim is 2.4 inches. This newsboy hat for women is made of the premium natural wool material. You can feel the softness and smoothness of the fabric when you touch the hat. Moreover, the hat is capable of keeping your head warm in the cool weather. Still, the fabric is breathable and well ventilated for you to wear the hat comfortably in the warm weather as well. Besides the high quality fabric of the body, the seams and the lining on the inside of the hat is also of the premium quality as well, which is soft and comfortable. They are also stitched nicely with no loose threads for extra durability. While this hat is available in 1 size, it comes with an elastic and adjustable hat band for you to have a better and more comfortable fit with this hat. The hat band comes with no lining to add extra comfort for your sensitive skin. In case you are looking for a wool newsboy cap in the unisex style which you can wear all year around, in the spring, autumn, and winter, check out this hat. 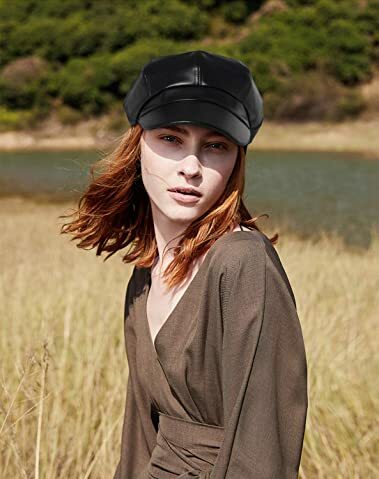 With its unisex and casual style, you can wear this newsboy hat with your favorite dress or you can wear it with a pair of Jeans for a relaxed look. 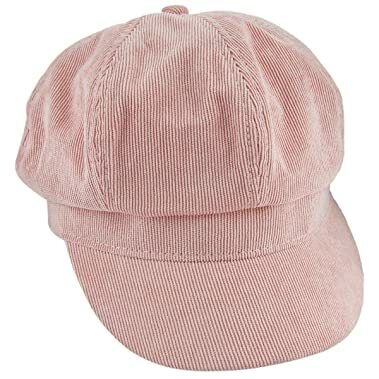 Its Main Features: This newsboy hat is made of 30 % of polyester and 70 % of corduroy. There are 20 choices of colors for you to consider such as pink, red, beige. It also comes with some dark colors including black and dark grey. This hat is available in 1 size that can fit head’s circumferences from 21 to 23 inches. The width of the brim is 2.16 inches while height of the crown is 5.19 inches. Undoubtedly, this hat is made from the premium quality material. While the hat is not the most breathable newsboy hats that you can find on the market, it is still soft, lightweight and comfortable to wear. 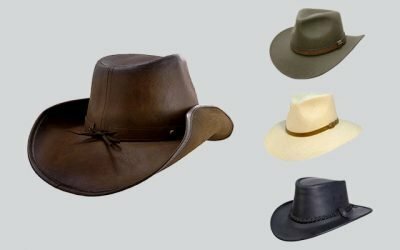 The hat is processed nicely so that it has a nice and smooth finish. Not to mention that the fabric of the hat is quite stretchy so that the hat can fit your head nicely and comfortably. There are many choices of colors for you to choose from including both dark colors and some bright colors. For instance, check out this red newsboy hat from this one. These colors are so bright and vivid that can really enhance your style. 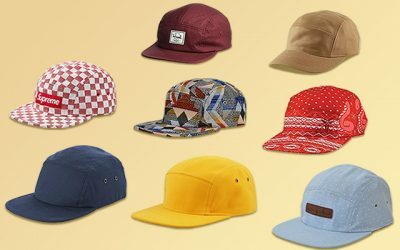 Another thing worth considering is that the fabric of this hat is fade resistant so that these rich colors would stay in their shape regardless of how many times you wash the hat. And it is kind of dirt resistant- so that you don’t have to clean the hat frequently to make it look shiny all of the time. This newsboy hat is a great choice for a casual outlook. You can wear it with a jacket or an overcoat. Thanks to its features, you can wear the hat when you go driving, walking or simply for everyday wear. Its Main Features: The fabric of the hat is made of 79 % of polyester, 17 % of viscose and 4 % of spandex. It also features lining which is made of 18 % of cotton and 82 % of polyester. 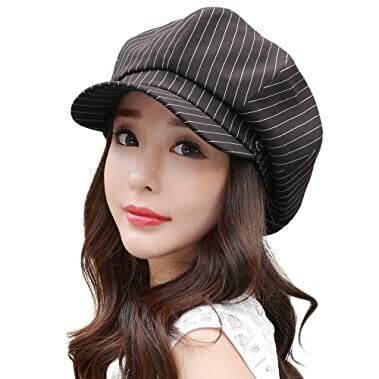 In case you are looking for women’s black newsboy hat, this hat offers several options for you to choose from including black with stripe or solid black. Other colors such as beige and grey are also available with this hat. This hat comes in 1 size that can fit head’s circumferences from 22 inches to 22.8 inches. The width of the brim is 2.5 inches while the height of the crown is 4.3 inches. It features the classic newsboy hat style with 8 panel construction and no button on top of the crown. The lining is made of the premium quality material. Moreover, the sweatband is also made of the high quality cotton for a soft and smooth touch. Thanks to the top notch materials, this hat is very lightweight and comfortable to wear. While this hat is available in 1 size, it comes with a Velcro tape adjuster for you to easily have a better fit with this hat. This adjuster is well hidden under the flap inside the cap so that it will not affect your comfort when you wear this hat. Other parts of this newsboy hat are also processed with an excellent craftsmanship. The bill is attached firmly and securely on the hat with double stitching lines. All of the stitches are even with no loose threads at all. With its solid classic design and colors, this hat is a worthy investment in case you are looking for an everyday hat that can easily go with the rest of your casual clothes in your wardrobe. 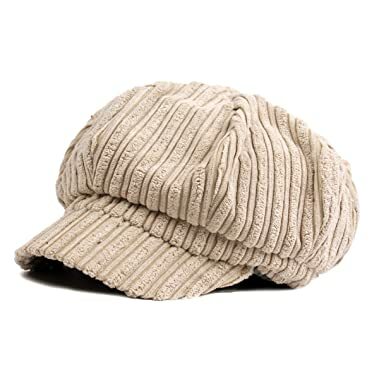 Its Main Features: This newsboy hat for women is made of 100 % of suede. There are several options of colors for you to choose from including grey, black, red and khaki. Like other newsboy caps that you can find on the market, this hat is available in 1 size that can fit head’s circumferences from 21.6 inches to 22.8 inches. The width of the brim is 2.75 inches while the height of the crown is 4.72 inches. 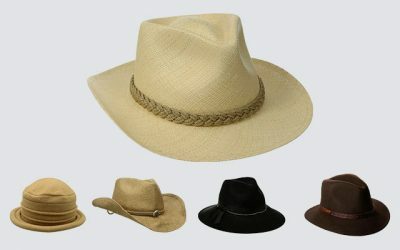 The material which is used to make the hat is the top notch quality so that the hat is soft and smooth to the touch. This hat is warm enough for you to wear in the cool day. With the thick fabric, the hat is capable of retaining heat and keeping your head warm and cozy in the spring and autumn. While the thick fabric of the hat is warm, the cotton sweatband of the hat is capable of wicking moisture away. You won’t feel hot even when you have to wear this hat for a long time. Moreover, this hat comes with an elastic band for a snug and better fit. The construction of the hat is quite solid and sturdy. Still, you can easily fold the hat and pack it into a small bag. When you take the hat out, it will spring back to its original form. Creases and wrinkles are hardly seen on this hat even after you fold it. The suede material makes the hat shiny and outstanding. 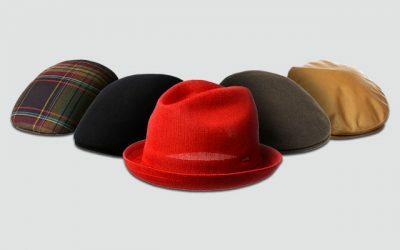 In case you are looking for a traditional and classical newsboy hat with a modern twist, check out this hat. The hat is suitable for your Vintage clothes as well as your everyday wear. 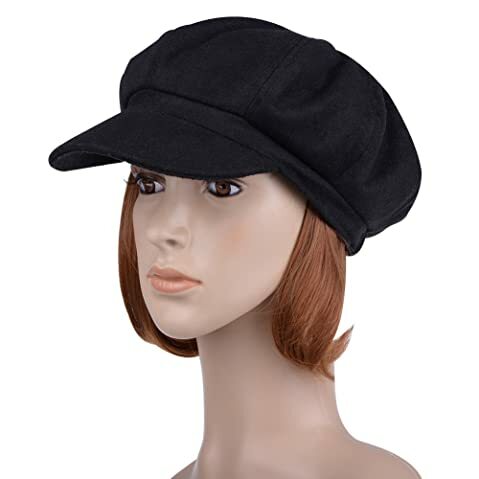 Its Main Features: This newsboy cap for women is made of 100 % of wool felt material. It is available in several choices of colors such as camel, beige, black, and grey. This hat is available in 1 size that can fit head’s circumferences from 22 inches to 23 inches. The height of the crown is 5.9 inches while the width of the brim is 2.6 inches. There is a drawstring which is built inside the hat to make the hat more stretchy and adjustable. Moreover, this hat also comes with a high quality lining and smooth sweatband. The sweatband can help to wick moisture away and make you feel comfortable even when you have to wear the hat for a long time. Also, the lining prevents your forehead from rubbing against the hat, adding extra comfort for you. With the soft material, this hat is crushable and foldable for you to pack it into a small bag. When you take the hat out, it will spring back to its original form. Not to mention that creases and wrinkles can hardly appear. Nevertheless, you can get rid of them by steam ironing the hat with a low temperature setting. The back of the hat is a little bit puffy but not too much. Therefore, if you want to hide your hair with this hat, it is totally possible. However, with a high crown, this hat can sit quite high on your head. Make sure you are comfortable with the size and this style before you purchase it. 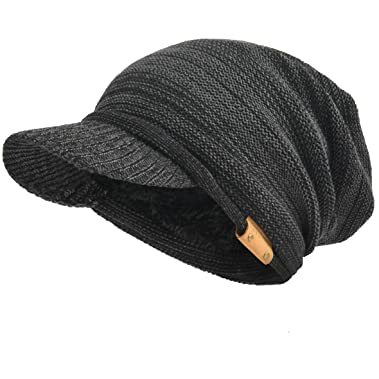 Its Main Features: This newsboy hat for women is made of 100 % of acrylic featuring thick fleece layers of knit yarn. There are 8 options of colors including dark grey, claret, blue and pale for you to choose from. This hat is available in 1 size that can fit head’s circumferences from 21 to 22.6 inches. The crown of the hat is 5 inches high and the brim is 2.5 inches wide. 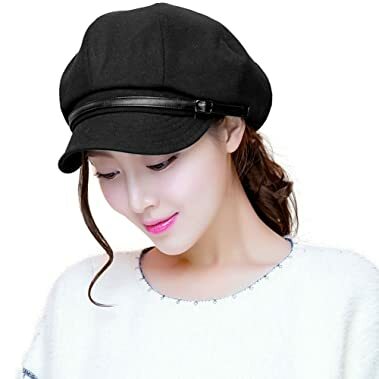 Provided that you are looking for women’s winter newsboy hats for the extremely cold days, you will not be disappointed with this hat. It features the design of the cable thick knit visor beanie which can cover your head and your ears effectively. Moreover, it is made of the top quality acrylic material along with the thick layers of knit yarn. 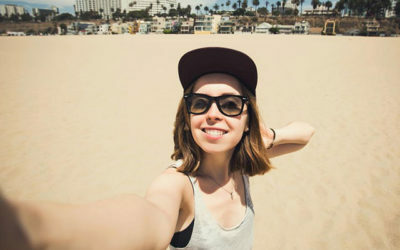 These features make the hat capable of retaining heat and keeping your head warm and cozy, even in the hottest summer days. Moreover, it comes with soft fleece lining so that the hat is still warm while being well ventilated. Another thing that I love about the material of the hat is that it is quite soft yet very tough and durable. You can still wash this hat in warm water if you like and it will not shrink or deteriorate in the quality of the acrylic material. The crown of this newsboy hat is quite tall, which provides a lot of room for your head. It is also stretchy for a better and more comfortable fit. And like other high quality newsboy hats that you can find on the market, this hat comes with an inner adjuster for you to easily find a better and more customized fit with this hat. Its Main Features: This women’s newsboy cap is made of 100 % of leather while the lining is made of 100 % of polyester. There are several options of colors for you to choose such as black, brown, grey, red, and white. This hat comes in 1 size that can fit head’s circumferences from 22 to 24.4 inches. The height of the crown is 4.5 inches while the width of the brim is 3.5 inches. Thanks to the high quality leather, this newsboy hat is extremely smooth to the touch. The leather is also fade resistant and durable. It is quite easy to take care of this hat as well as you can wash it under the cold water without worrying that this newsboy hat will shrink. 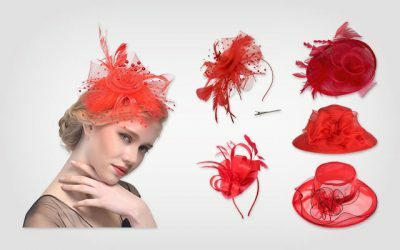 Besides the high quality material which is used to make the fabric of the hat, the material of the lining is also of premium quality as well. The brim of this leather newsboy cap is quite wide, which can help to provide a lot of coverage for your face along with your ears and your neck. The fabric of the hat is thick enough to prevent your skin from being exposed under the sun. Another thing that I love about this hat is that the material is water resistant. Therefore, it is ok for you to wear the hat under the light rain. Last but not least, this hat is available in large size as well. Note that most of the newsboy hats for ladies on the market only fit women with head’s circumferences of up to 23 inches. With this one, it can fit the head’s circumferences of up to 24 inches. If this size fits you, check out this cool and shiny newsboy hat. Its Main Features: This newsboy hat is made of 100 % of wool knitted yarn. There are 3 options of colors including blue, beige, and black for your consideration. The height of the crown is 4 inches while the width of the bill is 2.3 inches. This hat is available in 1 size that can fit head’s circumferences from 21.6 inches to 23.2 inches. This hat is made with the premium yarn material which can keep your head warm and insulated, even in the coldest winter day. While the yarn fabric can be tough, the hat is fleece lined for your comfort. The lining can prevent your forehead from rubbing against the yarn material and make sure you do not feel any irritation at all. The thick knit also contributes to a firm construction of the hat. The hat is not flimsy and thin. Moreover, this hat is made with an excellent craftsmanship for extra durability. The lining is sewn into the interior of the hat firmly and nicely with no loose threads at all. The bill is reinforced so that it is stiff and will not become flimsy at all. You can fold the hat into a small piece easily as well. While there are just a few options of colors for you to choose from, these colors are all rich and solid. It means that you can easily pair this hat with other pieces of clothes in your wardrobe. 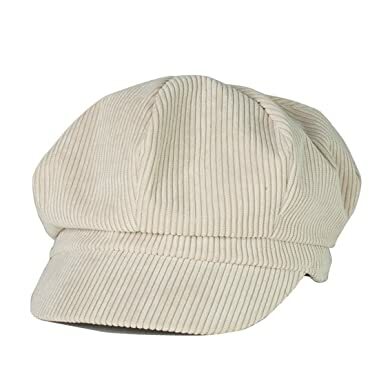 Its Main Features: This newsboy hat is made of 100 % of cotton blend featuring the corduroy finish. There are several options of color for you to choose from including beige, pink, red, grey and brown. This hat is available in 1 size that can fit head’s circumferences from 22 to 23 inches. There is an elastic strap at the back of the hat for you to easily adjust the hat for your best fit. The material of this hat makes it lightweight and comfortable to wear. It is quite well ventilated to ensure your head is dry and cool all of the time. And it comes with an inner sweatband to help flow the air and add extra comfort to your head. The headband is also made of the premium cotton material for which can prevent your forehead from rubbing against the hat and causing any irritation. While the hat is quite well ventilated, it is thick enough to add extra warm to your head when it gets cooler outside. This is one of the ladies newsboy hats which are easy to take care of. You can even wash this newsboy hat with the washing machine. 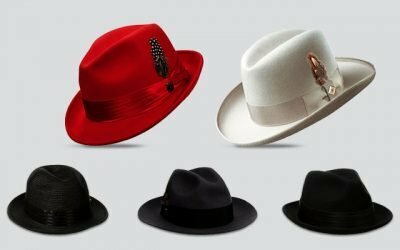 The fabric of the hat is fade resistant for the colors of the hat to look like new. And you don’t have to worry about dye running at all. Finally, this hat is made with a solid construction and firm stitching lines so that the hat can stay in its original form and look after a long time. With its classic look, this newsboy hat is a great additional to your Vintage clothes. It is warm enough for you to wear outdoor in the cool autumn and winter days. 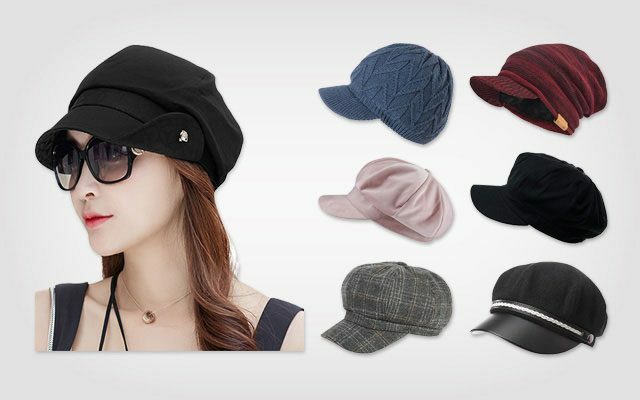 Its Main Features: This newsboy cap for women is made of % 100 blended cotton including cotton and polyester. There are 3 options of colors for you to choose from including beige, black, and camel. This hat is available in 1 size that can fit head’s circumferences from 22 inches to 23 inches. The width of the bill is 2.5 inches. With the premium cotton material, this hat is soft and comfortable to the touch. It is also well ventilated for you to feel comfortable wearing the hat when it is warm. The hat is not flimsy at all. In fact, it is quite thick with 2 layers of materials, which is capable of keeping your head warm in the cool winter days. Moreover, this hat features an inner sweatband, which helps to add extra comfort for you when you wear the hat. The sweatband can prevent hat hair and assist in wicking moisture away. It is also quite soft and smooth so even when you have a sensitive forehead, you will not feel irritated when wearing the hat at all. 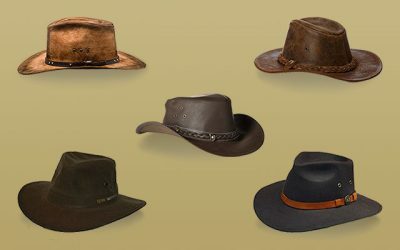 The bill of the hat is reinforced to stay in its original shape regardless of how you bend the bill. And all of the lines are well made for extra durability. This newsboy hat features the unisex style which can match well with your casual clothes. Also, the colors which are available are solid and easy to pair with the rest of clothes in your wardrobe. That is all about some of the best newsboy hats for women that you can find on the market at the moment. As you can see, they can be slightly different in designs with many choices of materials and colors for you to choose from. If you want a newsboy hat for a hot day, go for a polyester or cotton one. On the other hand, you would need thicker newsboy hats made from wool felt or wool material in case you want to wear it in the winter. A newsboy hat which looks good and has a high quality can be quite hard to find, given that there are thousands of choices that you can have on the market. 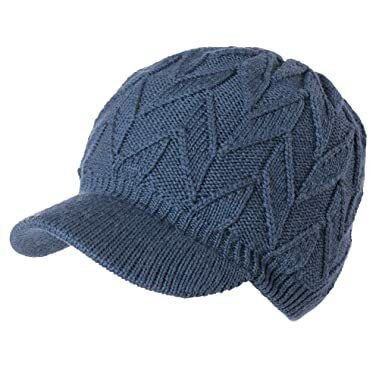 I hope that with the ultimate review above, you can quickly find a suitable newsboy hat that meets all of your needs and requirements in style to purchase.